In order to escape the orphanage where they are being raised as food for demons, Emma, Norman and Ray begin recruiting allies. But convincing the other children to believe them may not be an easy task. Start reading The Promised Neverland, Vol. 3: Destroy! on your Kindle in under a minute. 4.0 out of 5 starsThe Stakes get raised! 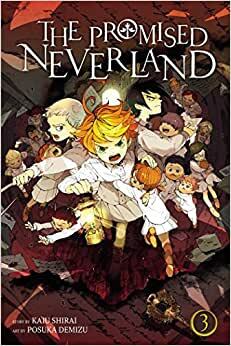 Promised Neverland Volume 3 continues the great mystery horror set up by the Other 2 volumes. With the mystery surrounding the farm and Isabella being the focus of this volume you once again see the stuff that was cut in the anime adaptation. Making the Manga worth the read from the anime. While it mostly good stuff and I recommend it. I do have one complaint about the manga and the story in general that is the character of sister krone. She's basically introduced written off just as quickly as she is introduce. Unfortunately the Manga follows the same thing as the anime arguable does it worse. Making the character kinda of pointless and yes she does play a key role to get the plot moving but it doesn't change the fact that she becomes rather obsolete quickly and unless it's all part of a bigger plan which I doubt it's becomes a plot digression. Other than that complaint the manga continues this thriller that always keeps you on the edge of your seat. TPN continues to be just as dark, just as good. My one and only complaint is the spoilers on the back cover. Don't read them before you read the manga! 5.0 out of 5 starsLeaves you wanting more. I can stop reading, my free time has turned into reading time, any extra time I have I give it to this story, my motorcycle has been sitting in my garage not used. What day is it? Did I have work?